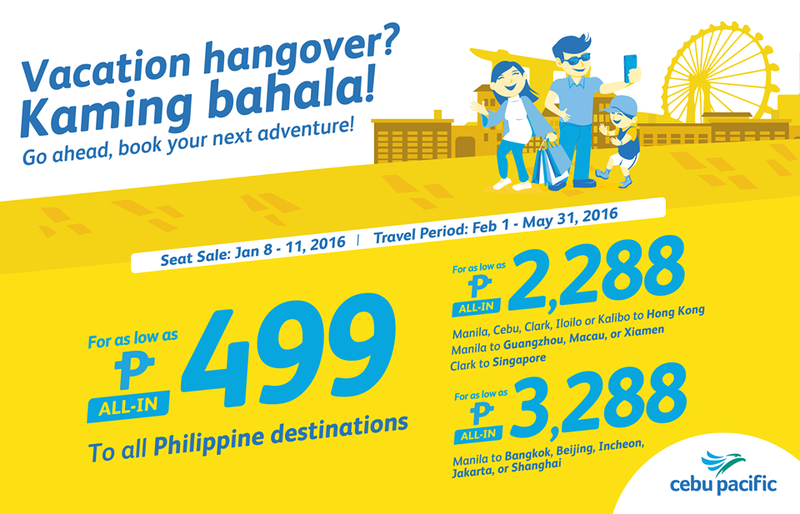 Piso Fare Promo 2016: The cheapest fare you can get for this latest Cebu Pacific promo is Php 499 to some selected Philippine routes. That's until January 11, 2016 booking period only. But the travel period will cover definitely summer 2016! So what are you waiting for? Mind the base stations. Key cities in the country are he base stations of this current promo. If you are in Manila, don't worry, you can still avail the cheap fare. So head to Cebu Pacific now and book your tickets! Vacation Hangover? Kaming Bahala! Go ahead and book your next adventure! More destinations await you. So check your calendar now and this is for a summer travel! AVAILABLE PA BA TONG PROMO NA TO?